Japan's Kei Nishikori rallied to defeat big-serving American John Isner 4-6, 6-4, 6-4 on Monday (AEST) to win the Washington Open and capture his 10th career ATP title. The 25-year-old Asian number one won his third crown of the season after defending titles at Memphis and Barcelona, taking the $US343,000 ($464,000) top prize at the US capital's combined ATP and WTA hardcourt event, a warm-up for the US Open that starts in three weeks. "I'm very happy to win today," Nishikori said. "It was a tight match." 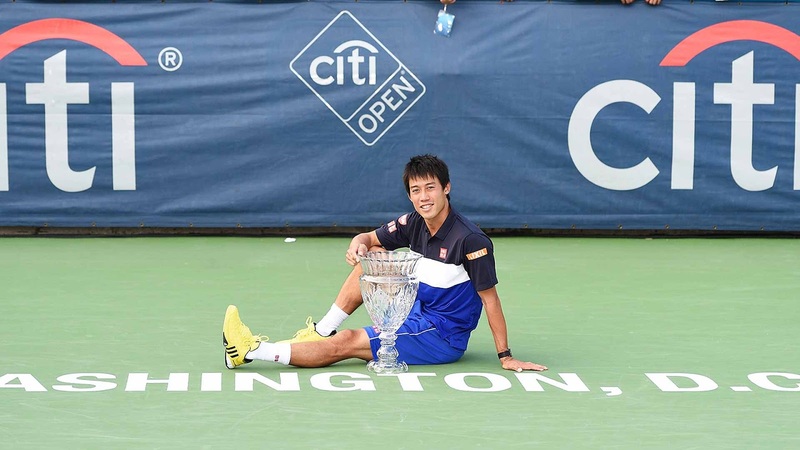 Nishikori, who will rise one spot in world rankings to match his career high of fourth, was last year's US Open runner-up to Croatian Marin Cilic, whom he beat in the Washington semi-finals in their first meeting since last year in New York. "I'm looking forward to playing again in the US Open," Nishikori said. Nishikori became the first Asian singles winner in the tournament's 47-year history despite connecting on only 59 percent of his first serves. He managed to win 42 of his 46 first-serve points. Isner, who won his only prior meeting with Nishikori in April's Miami quarter-finals, missed a chance for his 11th career ATP crown after winning his third consecutive Atlanta title last week. Isner, who fired 18 aces to five for Nishikori, will jump from 18th to 12th in Monday's rankings. "It's never easy against a big server like John," Nishikori said. It was Isner's third loss in a Washington final after falling to Andy Roddick in 2007 and Juan Martin Del Potro in 2013. In the women's final, American Sloane Stephens won her first career WTA title with a 6-1, 6-2 victory over Russian Anastasia Pavlyuchenkova. Stephens, ranked five spots ahead of her rival at 35th, had been the highest-ranked player never to reach a WTA final before making it in her 84th tour event. Meanwhile Angelique Kerber of Germany beat Karolina Pliskova in a tight three-set battle in the finals of the Stanford WTA tournament on Monday (AEST) to match Serena Williams for most tournament titles this season. Kerber closed out the up-and-coming Czech player by claiming the last two games of an entertaining two hour, seven minute contest for a 6-3, 5-7, 6-4 victory. It was Kerber's fourth victory of the year, tying Williams, who defeated the German in the Stanford final last year. Williams' total, of course, includes the first three grand slam events of the season with a shot at a calendar-year Grand Slam sweep at the upcoming US Open.